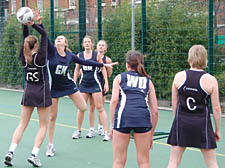 TITLE-chasing Cumberland asserted their position at the top of the table on Saturday with a convincing win over the POLY ‘A’ team in the Premier Division of the Middlesex Netball League. Having lost to POLY in the first-half of their campaign, Cumberland were determined to beat their rivals and exact revenge for what has been their only defeat of the season. After a close first quarter the Camden-based team started to dominate the game as their strong mid-court defence and pressure in the shooting circle forced a string of errors, creating vital turnover balls. Under the guidance of player of the match Rebecca Squires, Cumberland continued to show great focus as they powered their way to a 38-22 goal victory. Cumberland return to action on Saturday when they take on Academy in the POLY League at the Camden Sports Pitch.